Cultivating a welcoming business environment is instrumental to a successful business. There are a lot of elements that contribute to a setting that people will respond positively towards; even the smallest factors can make or break a visitor’s experience and influence a return visit. This article will explore the top 5 factors that will enhance your business environment. From the television on the wall, to the stereo speakers playing music – to the friendliness of the staff, and even the cleanliness of the rooms; no element is too small when it comes to its role in generating a welcoming atmosphere that visitors will enjoy. But why is each one important? How can you take control of the most important elements? “In addition to being the sense most closely linked to memory, smell is also highly emotive.” – Fifth Sense: Psychology & Smell. Scents, as well as anything having to do with the 5 senses, are the foundation of a lasting impression. The right scent can invoke memories, familiarity, and associations that make for a positive experience. As beneficial as a good smell can be, a bad scent can leave just as strong an impression – perhaps stronger in some cases. There’s nothing like fitting music playing in the background to make you feel welcome. It helps you take in and appreciate your surroundings a little more. Whether it’s the radio, or some simple sound ambience, a little music can help visitors relax, unwind, and put them in a more positive mindset – which is good for you, your business, and your bottom line. Never underestimate the power of a pristine and organized business environment. The skills that may ring in your ears from when your parents to tidy your room are the very same skills that can be applied when improving your business. Something as simple as making sure magazines are nicely stacked, or making sure chairs aren’t dirty or in bad shape goes a long way. In order to improve visitor satisfaction scores, keep everything neat and tidy – especially the restrooms. People love to write reviews about bad experiences, typically more than they’re compelled to write good reviews on sites like Yelp, or Google. Keep on top of appearances. Set small goals or daily checklists to cover each day so the business is left in a welcoming state for the next. It goes without saying that the friendliness, attitude, and people-skills of your employees contribute to one of the biggest factors that make up a successful business environment. A bad experience caused by someone you employ is a fast track to a bad Google or Yelp review. And worse, the review will stick there for the whole world to see a lot longer than their visit lasted. Aim to make your staff happy. If they are happy they will hopefully pass their happiness onto your visitors. Finding ways to celebrate your staff, or highlight their achievements, is a good way to boost workplace morale. Possibly the most important, and certainly the most versatile tool available to business owners, is the TV. Whether it’s the news, some random channel, or just white noise, the familiar glow of a TV can go a long way. Familiarity is a fine foundation for a relaxing setting; when it comes to generating a positive business environment, nothing is more familiar than a television set. TVs are great, but what’s on those TVs matters more. Depending on which service you choose to run on your TV, you could be spending a lot without getting anything back. It’s Relevant TV creates custom TV networks that are designed for businesses. Instead of attention-demanding TV shows that run 30-60 minutes long, It’s Relevant plays short, 1-4 minute videos across a broad range of categories you choose from. People like a variety of different things, so there are a variety of different things on the TV for everyone to enjoy. The interesting, family-friendly content engages viewers and gets them looking at the TV. With It’s Relevant TV, you’re able to reach the people who visit your business in ways that you simply can’t with cable. Unlike cable, It’s Relevant gives you control over what goes on the TV – which includes your own custom videos and messaging that you want people to see. The service allows you to upload as many personal videos, ads, and messages as you like; and played them in between and alongside our fun and engaing content. Don’t settle for a TV subscription that gives nothing back. If you’re keen on building a better waiting environment, visit ItsRelevant.com. It’s Relevant TV is a lot of things, but there’s also a lot of things it isn’t. When it comes to what’s on your TV, separating fact from assumption is important to your business, and your bottom line. This article will address some of the common misconceptions people have about IRTV. You might have seen “custom TV networks” that turn out to be nothing more than a short list of dry/boring videos that loop endlessly – It’s Relevant TV is not one of these networks. It’s Relevant works with content providers and pulls its ever-changing content from a library consisting of over half a million videos. These videos play seamlessly and can be mixed with your own content to for added customization. It is not a looping display that pretends to be TV. 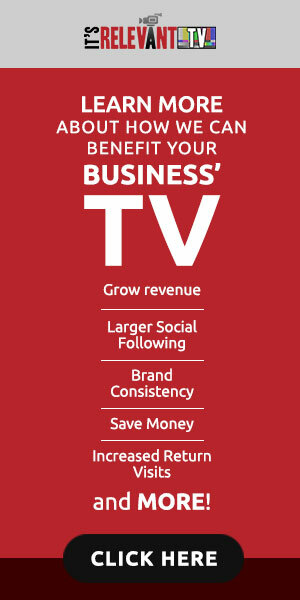 It’s Relevant TV is designed to make you money while costing less than the average business cable service. IRTV gets people to come back more, and spend more by educating visitors on additional services your business offers. It’s Relevant features space on the side for you to showcase any ads, reminders, or images that you want people to see. IRVT helps generate more revenue and repeat business each month by focusing on customer retention. Check out the ROI Calculator to see how much you could be generating each month with It’s Relevant. A TV channel for businesses that is fully customizable, allows you to manage content categories, integrate social media, and upload personal ads/videos for everyone to see has to be pretty complex, right? Not at all. It’s Relevant can be easily managed through virtually any phone, tablet or computer. The customization features are broken down into self-explanatory tabs that are straightforward, easy to navigate, and accessible anywhere. Cable TV is an expense which gives nothing back, gives you no control beyond manually changing the channels, and is plagued with competitor ads that you’re literally paying for visitors to see. It’s Relevant is none of those things. And while each IRTV is a living, breathing, TV network – it isn’t cable. IRTV is a vital tool designed to improve visitor experience and improve your business in ways that cable can’t. Change can be hard, but it’s worth exploring when that change can improve visitor experience, or help generate more revenue. People say “don’t fix what isn’t broken,” however staying the same forever can be just as bad. Being set in your ways might close doors to new, and innovative ideas your competitors will happily open, which is why it’s important to give it a look. Putting your own custom videos on the TV is a great way to improve your business. If you read the article: Top 3 Ways to Put Custom Videos on Your TV, then you understand the reasons why It’s Relevant TV has become the go-to for businesses looking for ways to put their own videos on TV. If you haven’t seen it, keep reading. This article will talk about pros and cons of putting your own custom videos on your screen, and how you can make the most out of them, and your TV. 1. You Have Control: When you’re running your own content on your TV, you’re in control of what comes on. Whether it’s videos or a slideshow of pictures, visitors aren’t going to see anything except what you want them to see. When you decide what’s on, you also choose what’s off. You can keep repetitive news reports, fires, stabbings, explicit language or adult situations off of your TV. 2. It’s Your Brand: Videos that you produce, or videos that you pay to have produced, belong to you. It’s your brand, it’s your image, and it’s whatever message you want to get across to people visiting your business. Custom videos are also a great way to feature spotlights on staff, or experts in your field with relevant things to share. When it comes from you, you are the authority. 3. It’s Unique: By putting together your own custom content, you’re making something unique for your business’ visitors to experience. The right video and personal message can make all the difference when it comes to first impressions, a memorable experience, and how well you compare to competitors. 1. Shallow Library of Content: Custom videos are only really effective when you have enough of them. People get tired, or even annoyoed, when they see the same videos looping again and again. Having too few videos makes for a bad visitor experience, and can lead to a bad impression of your business/brand overall. 2. Boring / Uninteresting Content: People look to TVs in businesses to help pass the time, so it helps to have things on the TV that will interest them or put them in a good mood. Having just your own custom videos might be off-putting to some people. If visitors are only seeing your messaging and brand when they look at the TV, you risk overexposure. It’s a good idea to have a balance of content you want visitors to see, and content they want to see. 3. The Cost: Ditching a monthly cable bill and replacing it with a library of personal content definitely saves you money in the long run, but unless you have a vast library of content at the ready, the cost of producing your own personal videos may require a large up-front investment. It’s Relevant TV creates custom TV networks for businesses. It combines the best aspects of television and digital signage. IRTV delivers content that is interesting, engaging, and helps get your messaging across. Your own custom content is intermixed with a library of half a million videos – presenting visitors with your messaging in a way that makes them receptive to what you want them to see. With It’s Relevant, there’s no cost beyond the subscription fee which is often less than the cost of cable. There’s no need to break your bank on production costs in order to build up a library of content. You can mix one or many videos with IRTV’s library of content, keeping however many videos you have fresh. The goal with any custom content is to get people to notice your messaging so they come back more, and spend more. It’s Relevant TV offers a demo of the platform so we suggest scheduling an appointment to see if it fits your needs. Everyone knows the phrase “You get what you pay for,” and nothing is more enticing than something free – especially when it includes a TV for your business. Trying to get the most while spending the least is a sound business tactic. It makes sense to think that spending $0 for a service that you want in your business is a win-win. But what’s the catch? This article tackles the top 5 issues that come with free TV services and the ways it impacts your practice. If you’re already aware of the risks and you’re looking for a better alternative for your TV, then check out a custom television service we recommend that’s made for medical practices. 1. Who’s Paying For Your Free TV? Contrary to what Sam Cooke was singing about in the 1920’s, the best things in life aren’t free. If someone approaches your business offering you a free TV service, it isn’t out of the goodness of their heart. It’s about business. You might not be paying any money for the service, but it does come at a cost. If the service provided isn’t getting their money from you, they’re getting it from someone else. That someone else is the one who ends up having the most control over what’s on your TV. Advertisers pay for the messaging, so most of the content is there to benefit them – you have a lack of control over what your patients are seeing. If you’re not paying for your TV in money, you’re paying for it in other ways. The prospect of a free TV can be enticing, but don’t fall for it. There are better alternatives out there. In a hospital, clinic, or medical office, a medical TV service that costs very little, or nothing at all, might seem like a great idea because it’s health-related and compliments the medical setting. But how does it make patients feel? Visitors might be there for health-related reasons, but that doesn’t mean it’s the sort of thing they want to watch while they wait. Graphic cross-sections of the human body, gross videos about clogged hearts or debilitating diseases, or even pharmaceutical ads for pills patients can purchase – however informative or well-intended these pieces are, it can make patients anxious or lead to an overall bad experience. The visit starts in the waiting room and you owe it to your patients to put something on the TV they will enjoy. The content that comes with free services are often outdated, uninteresting, unsettling, or of poor quality. The providers of your free service pay as little as they can to procure cheap content that they can play over and over again forever. In the end you’re left with the bottom of the barrel, or the least amount of effort your provider has to put forward in order to hold up their end of the bargain. Don’t settle for this kind of service. If you’ve ever used a free TV service in your business or clinic, you might have experienced the frustration of waiting for the system to update. If you haven’t, then based on the previous sentence you could probably guess that it can take a very long time. Sad but true; in most cases, providers of free medical TV services are busy serving the clients that pay them, a.k.a. pharmaceutical companies that are advertising through their platform. As a free user, you rank lower on their list of priorities, and therefore updating your individual TV is often something they’ll “get around to doing,”… eventually. Free TV services rob the potential your TV has to improve your practice, patient experience, and your bottom line. When you settle for a free service you’re sacrificing the most effective tool for communicating with your visitors. A free TV and several hours of dry, looping content isn’t worth the expense of your patients’ comfort. It also isn’t worth the lost potential that your own controlled TV network can provide you with. Don’t short-change yourself. Instead of settling for one of these “free” services, utilize It’s Relevant TV – and for a small monthly fee you’ll have access to interesting content visitors will enjoy. You’ll have control over what’s on your TV, and you’ll see a real return on your investment. With It’s Relevant you control what messages patients see, getting them to come back for other reasons, ultimately raising your per-patient-revenue. Outside companies shouldn’t be the ones getting the most out of your business. Schedule a call or demo with It’s Relevant TV to learn more: http://www.itsrelevant.com/medical. If you’re reading this, then you’re probably interested in learning more about the different kinds of TV software available for waiting rooms in businesses, medical offices, and the like. As a business owner, manager, or owner of a practice, it can be hard to find time to sift through all the options out there. If you’d like to save time, check out It’s Relevant TV. It’s an all-inclusive TV software and TV program provider that can meet most needs. Much like the Field of Dreams phrase: “If you build it, they will come,” if you hang a TV in your waiting room, people will look at it. Once they see it, you want them to continue to watch it, and that’s the tougher part. It’s important to have something on the TV they will enjoy. Owners like to put cable on their televisions, which is great if you’re at home. But in a business setting, or medical office the programs are too long and not as engaging. Slideshows or industry-related looping displays suffer the same kind of problem. Simply put: They’re boring, and people aren’t going to watch them on the TV. You need waiting room TV programming that will catch people’s attention and give them a reason to keep looking. IRTV for waiting rooms is a tool that helps draw attention to your TV, and gets visitors to notice important messaging you want them to see. Waiting room TV programming that is difficult to use, set up, or manage, can be frustrating beyond words. TVs shouldn’t be difficult. Owners should be able to put something on the TV with as little effort as possible, while being able to walk away with the confidence it’s going to work without them constantly needing to come back and fix things. IRTV is the “set it and forget it” of waiting room TV software. Straightforward and easy-to-use, you’re able to customize and control every aspect of the service through our digital signage app; from your phone – regardless of where you are. The best waiting room TV software is one that doesn’t cost an arm and a leg. Cheap cable TV is the standard for many business owners, but in the end, you always get what you pay for. Monthly cable bills stack up, and if your cable subscription is nothing but a flat expense, consider an alternative that actually gives back. IRTV brings a noticeable ROI to your business. The engaging content gets visitors watching the TV, while your messaging educates them on reasons to come back. The It’s Relevant ROI Calculator can show you just how much additional monthly revenue you can make if you switch. It’s Relevant TV is engaging, easy to use, and inexpensive. The short-form, family-friendly content informs, entertains, and gets people looking at the TV. Managing It’s Relevant is done through an easy-to-use control panel/app that is straightforward; and technical support is available at your convenience. Other services cost you money, It’s Relevant TV makes you money by getting people to come back more, and spend more. Schedule a demo with It’s Relevant TV and discover how it can help improve your business.